Student must emulate the ideas of servant leadership in accordance with the ISU Alliance for Servant Leadership: transformation, personal growth, enabling environment, service, trusting relationships, creating commitment. Max E. Douglas, Professor Emeritus, joined the College of Business as a faculty member in 1968. Dr. Douglas received his bachelor's and master's degrees from Ball State University followed by his Doctorate in Education from Indiana University. 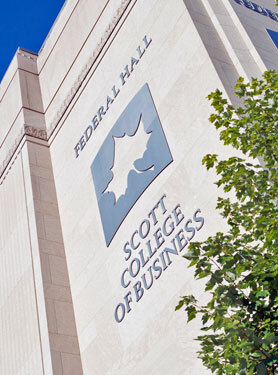 Throughout his tenure in the Scott College of Business, Dr. Douglas has taught a variety of topics, including organizational behavior, small business management and entrepreneurship, leadership and organizational change, and business ethics. His research has focused on eustress, teaching and learning styles and ethics in the workplace, among other areas. A recipient of the first Outstanding Teacher Award from the College of Business and the university's Caleb Mills Distinguished teaching award, he also authored books and various magazine articles.